Ever think you’d see the day UNLV’s football team outscored the Runnin’ Rebel basketball team? 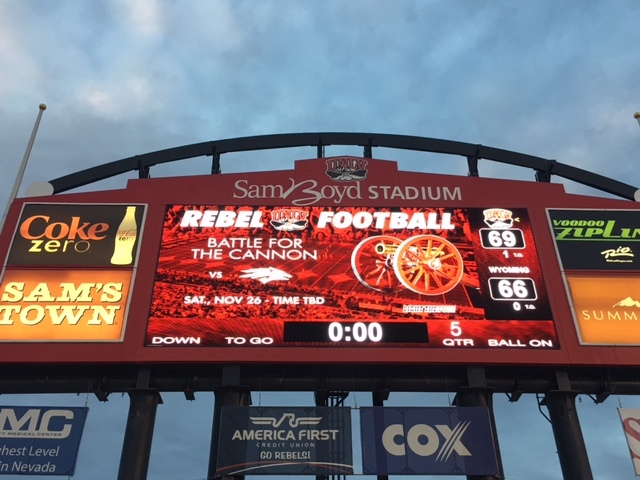 About 19 hours after the UNLV basketball team dropped its season opener to South Alabama, 76-68, Tony Sanchez’s Rebel football team put up 69 points in a wild 69-66 triple overtime win over Wyoming on Saturday afternoon at Sam Boyd Stadium. The 135 points by the two teams easily shattered the Mountain West record for most points in a game (117) and was just one point just off the NCAA record set by Boise State against Nevada on Oct. 14, 2007 when the Broncos defeated the Wolf Pack, 69-67, in four overtimes while both schools were in the WAC. Backup placekicker Nicolai Bornand’s 40-yard field goal in the third overtime won it for UNLV (4-6, 3-3 Mountain West), which kept alive it bowl game hopes for another week. Bornand’s kick came three plays after cornerback Torry McTyer intercepted Wyoming quarterback Josh Allen at the Rebel one yard line to deny the Cowboys at the start of third overtime. Quarterback Kurt Palandech led UNLV, rushing for a game-high 157 yards and a touchdown on 16 carries and also completing 20-of-32 passes for 252 yards and three touchdowns as the Rebels rolled up 653 yards in total offense, including 401 rushing. Check out VIDEO highlights below.